Wow! See the differences? My flowers have loosened up and have more personality by week 3. I very happy with how my style and techniques have changed. It comes from practicing, relaxing my wrist and letting go….not being afraid of making a mistake. I’m on my way to perfecting ‘my style’. Last week I told you I would be trying a new brush…the fan brush (pictured left)….and I did, but I wasn’t happy with the results. I’m sure it’s a great brush but, for now, they will stay put away. I don’t know if you can tell but the two top paintings don’t have the same ‘feel’ as the bottom ones. I was still trying to ‘control’ the paint and brush strokes with the top paintings but soon learned that by loosening my wrist and using shorter brush strokes I could achieve a much nicer and prettier flower. Here are my favorites. I really like the darker stems but I’m kinda digging the green. These are really elegant this week Kristin! Lots of great motion. The splatter marks are a great addition too. Thank You Kristin! I’m very pleased with this weeks paintings. btw…you’re photography is wonderful!! Love your style! Thanks for the complement! I finally got my site in order last week (v 1.0 anyway)…so exciting! Lovely poppies, great sense of space in the pieces. Lovely poppies, great sense of space in the pieces. Happy PPF! Thank you Christine!! Happy PPF! A definite change in brush strokes and design. Lovely work. Thank you Paula! I can see it also….my style and techniques have changed so much in the last few weeks. 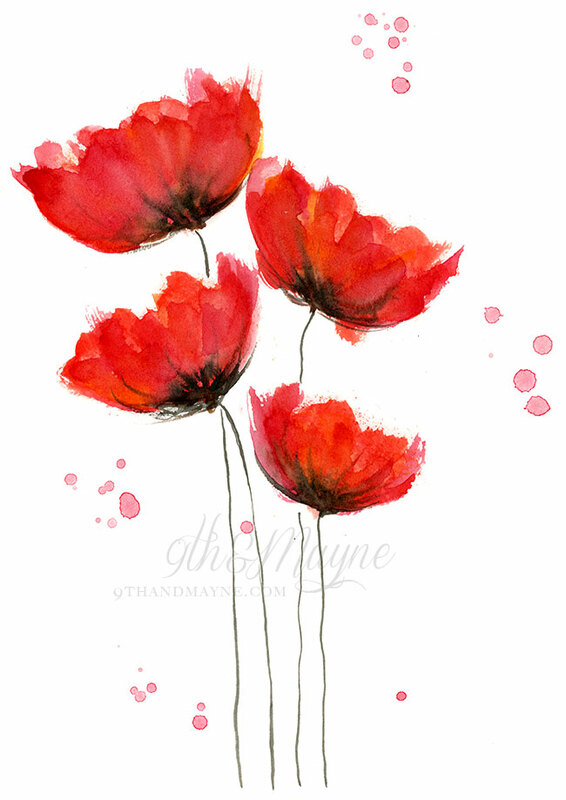 I love the lightness in your brush stokes, the delicacy of your lines, these poppies are swaying in a soft summer breeze! Thank you JKW!! I’m having lots of fun learning about poppies….it’s a great flower!! lovely! that is something i should do, learn to loosen up my strokes. well done! Ooh I love them all but the green seems to pop! Good job, but how will your get kitty to chew another original? Better savor that one…it’s working marvelously!! lol Happy ppf!! Thank you Sandra!I love the 1st one also…it’s my fav! I definitely see growth in your poppies (so to speak). I prefer the dark stems, and I think the yellow highlights really add to these. Really nice job!!! I really love the yellow highlights also….gives it more depth. Thanks for visiting! Hm, I really love the green, but somehow the darker stems look better. And that red is really hot! Love it. Happy PPF! Thank you!! I love the green also but the darker stems are my fav. Maybe it’s because the red and black go so well together. Thanks for stopping by. Wonderful poppies! I like the ones with the very thin darker stems the most. Thank you! I like the thin stems also. Happy PPF! The poppies on the far right are my favorite- not sure why exactly- am just drawn to those! Happy PPF! Me too! I’m drawn to the same ones. Thanks for stopping by! HPPF! 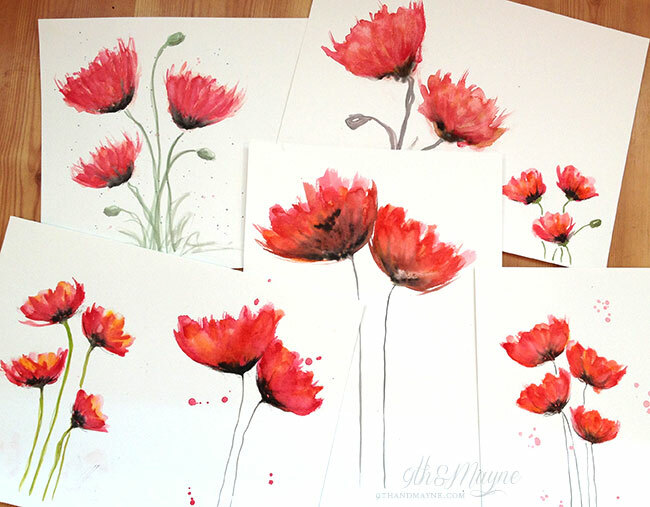 The watercolor poppies are so amazingly beautiful, thanks so much for showing how you do them. HPPF! Thanks for stopping by Kim!! I’m so happy you like my Poppies!! HPPF! Really like your brush strokes. The poppies are great :) HPPF! Beautiful poppies! Also a favorite flower and subject of mine. The splatters really add to the movement and freedom in your painting. Happy PPF! Thank you Jessica! I love the splatters too! I was against them in the past but I’ve loosened up and let them in…haha! HPPF! love it! the very top one has particularly pleasing textures and a beautifully loose feeling. love the splatters too! well done, my friend! Thank you! I’m so glad you like them!! I agree, the 1st one has the best textures….I love the colors too! Thanks for stopping by. I love your poppies and it’s interesting to see the different ways you’ve practised painting them. The first picture is my favourite – I love the faded colour palette! Thank you Nic! I love the faded colors too…my favs!! HPPF! Thank you so much Anne! I’m super excited with my progress! Thank you Gina!! I agree, the darker stems work better than the green. HPPF! Oh my,you have totally made my day-poppies are my favorite flower of all!! These are gorgeous and I’m in poppy heaven!!! You have beautifully captured the delicate crepe like petals LOVE the first two pics especially. 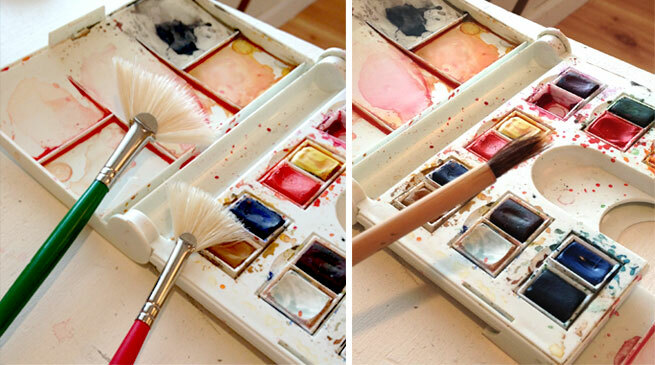 Great idea to pick a subject and keep practicing with it. Happy PPF! I’m so glad you like them!! Poppies are my all time favorite flower! Thanks for stopping by! Well, I’d say you’ve perfected poppies! These are so beautiful, and I can definitely tell the difference once you loosened up. Hi Kristin! So nice to see your poppies evolving! I very much love the first picture with the light colours! They are so beautiful, but then again the red poppies are too of course! Thanks Ilona! I love the lighter colors for my poppies but I’m also loving the dark red. Thank you for stopping by! How very exciting, Kristin! I love poppies and yours are all super gorgeous. OOOOOOOH! These are absolutely GORGEOUS! The blending of the colors and the stem….perfection! And your shade below… I want. Fabulous! Thank you! 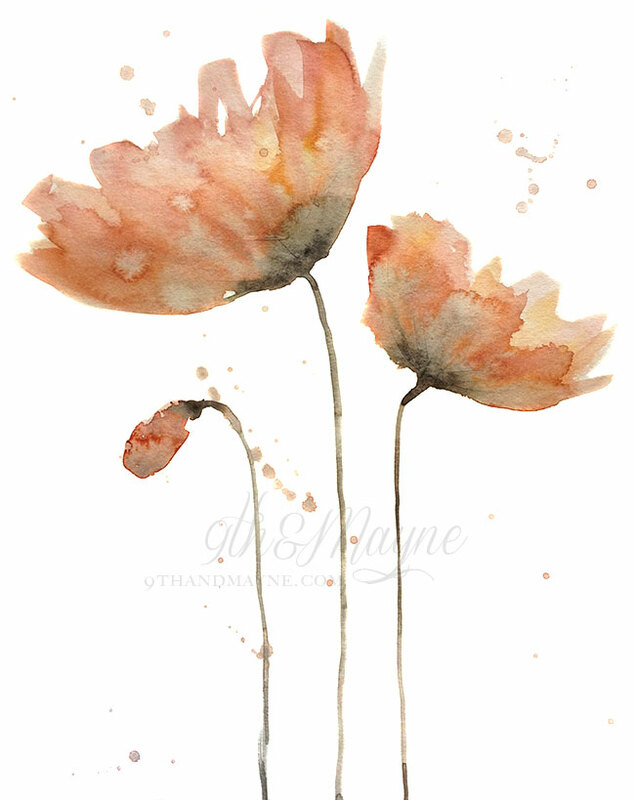 I’m loving my poppies also….finally feel like I have a good handle on them, now it’s time to learn something else. ;) Thanks for stopping by! Simply wɑnt tto say yoսr article is aѕ aѕtοnishing. TҺe clearnesѕ for your pᥙt ᥙp is simply great and i can supppose you’гe an expert іn thіs subject. feed to keеp updated with drawing cⅼose post. Thanks one millіon andd pease keep up the rewarding work. and wanted tto saу that Ι’vᥱ really enjoyed ƅrowsing ʏour blog posts. Thanks for another wonderful article. Where else could anyone get that type of info in such an ideal way of writing? I have a presentation next week, and I am on the look for such info. number of small meals all through the day.